On the last day before students went on spring break the U.S. Department of Education held a summit at the San Diego Community College campus. Despite the date, over one hundred students and faculty arrived at the campus at 8am to protest the hypocrisy of the education summit. According to government documents, the President’s goal for 2020 is for the United States to have the highest proportion of college graduates in the world. This is contradictory to what is truly happening. A recent announcement informed students and part time faculty that the summer session for the entire San Diego Community College District would be cancelled. As a result of the cancellation, all part-time faculty will be laid off, and as many as 35,000 students will be affected. Students and faculty from campuses throughout the district came and spoke to the real problem facing public education, capitalist greed! Student after student gave testimony as to how the cancellation of summer session was going to affect them and how if the government really wanted to help students and veterans they should quit canceling classes and raising student fees. Protestors then began a march around the school and took over the street on Park Blvd in downtown San Diego. From there they marched straight to the Seville theatre where the summit was being held. Unfortunately, the students and faculty were not allowed into the theatre. Due to pressure, a district administrator came out to speak to the student protestors. He offered only lip service and attempted to give excuses for the budget problems that students are forced to deal with. The students weren’t having it and after respectfully allowing him to speak went back to the truth behind the budget problem. After shutting down the street for over an hour, students marched back to the campus to continue the protest of the summit at their lunch break. This time the police prevented the students from even stepping foot into the campus quad. The summit organizers had ordered the lock down of the whole quad area where the summit lunch was being prepared. Students quickly reorganized and found a gap in the police lines and were able to get back onto the campus. The students then proceeded to occupy the lunch area and sat at the white linen tables with silverware. By this time the administration and police had become furious and started surrounding the students, while staff also removed all of the linens and silverware. This caused City College President Terrence Burgess and the District Chancellor Constance Carroll to come and speak to the students in another futile attempt to make excuses for the ruling class. After a stand off, the Administration was to forced to agree to meet with the students to discuss what students feel could fix the budget problem, at the top of that list was taxing the rich. 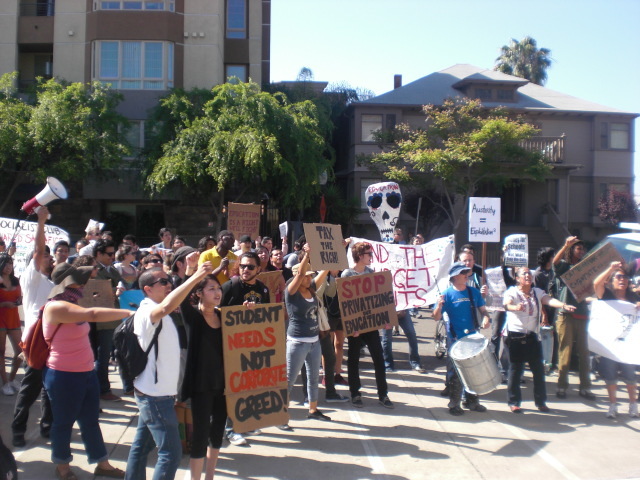 The rally that took place and the spontaneous action on behalf of students and faculty show what strength the working class has over the capitalist and their servants. The ruling class trembles in fear when the working class comes together to demand what is rightfully theirs, free education, jobs for all and an end to imperialist wars.